For many new gardeners or foodies, the idea of harvest or stocking up seems like a fall-festival–type of activity. Nothing could be further from the truth. Harvest is happening all the time! And to be truly prepared for winter (which is, thankfully, months and months away), now is the time to start stocking up. Today I froze some strawberries. The so-tiny ones that are locally, organically grown and so very tasty are only available for a few weeks during the early summer (it’s still technically spring!). At the farmer’s market I bought three pints (and a half pint that I split with a friend). One and a half pints just got downed tonight with a bit of sugar and cream. Yes, real cream. Organic cream! At first the kids thought it was gross—until they tried it and then they fought over it. But the other two pints got cleaned, the green tops trimmed off, and the berries placed on a cookie tray. Then I popped them in the freezer. By the evening, they were frozen and I put them into baggies for later use. My kids like to eat them like little frozen Popsicle treats. But they are good for smoothies, too. 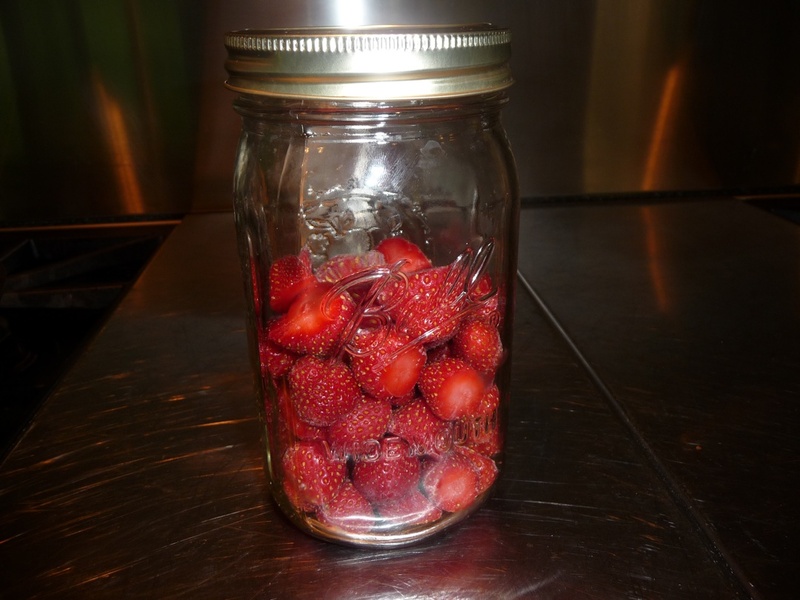 My two little baggies of strawberries won’t last long, but every time I use them or give them to my kids it will feel like late June (crickets chirping, frogs burping), even when the days are dark and cold (boo, hiss!). And if there are more next week at the farmer’s market, I’ll do it again. But it’s not just strawberries. I already have rhubarb in the freezer. And soon the sour cherries and blueberries are due. Also, the basil is looking really good, so I’ll have to make lots and lots of pesto. Last year I waited too long and I didn’t freeze any pesto, and we regretted it all winter long. Sure, it seems like a lot of work when you are standing at the sink cleaning and cutting. But it’s local, organic, and packed with love and happy memories, and that’s the best nourishment of all. 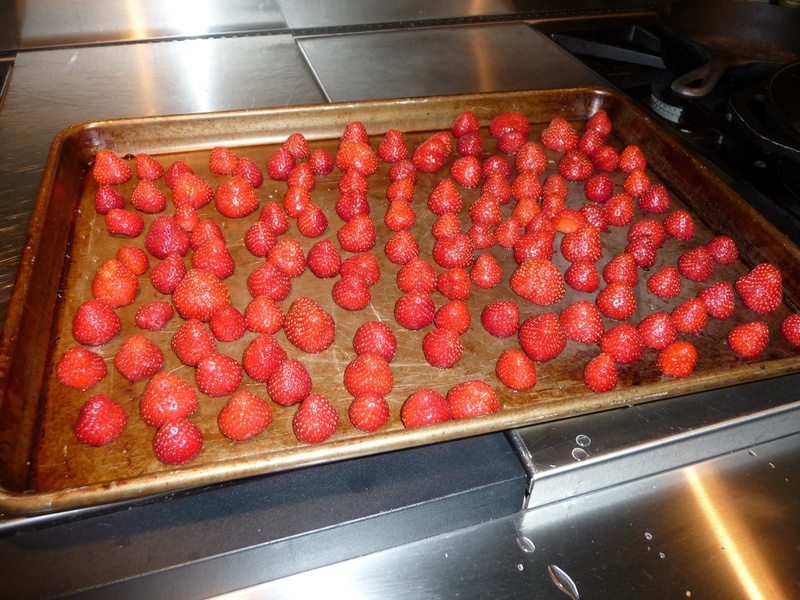 Clean the strawberries, cut off the stems, place them on a cookie tray and freeze. After they are frozen, put them in either a plastic bag or a glass jar, and keep in the freezer until you eat them. 7 Responses to Stocking Up Starts Now! Preserving even a few extra servings all spring, summer, and fall adds up to a huge pile of “free” good eats during the cold months. If you don’t have a freezer or prefer to use less energy to keep your bounty until you are ready to eat it, consider drying some. I don’t have a food dryer, but my old fashioned propane oven has a pilot light and I take advantage of that very gentle heat and almost always have a tray or two (I have a pair of perforated pizza pans that work well) of whatever is ripe and bountiful in my garden at the time. So far this year I’ve made some batches of rhubarb-ginger leather (made with local raw honey as the only sweetener) that taste so much like really good tangy candy I’ve had to hide them from my son or they would already be gone. One of last summer’s favorite discoveries was dried cherry tomatoes (cut in half and put cut side up so they don’t stick). Soaked in a little hot water these little gems were fantastic on salads all winter long and the ‘sun gold’ (super-sweet yellow ones) were out of this world in the the gray days of January. So how long can you keep strawberies frozen in the feezer? Those berries are beautiful! I love berries with fresh, organic raw cream from the farm. Can you freeze cherry tomatoes? 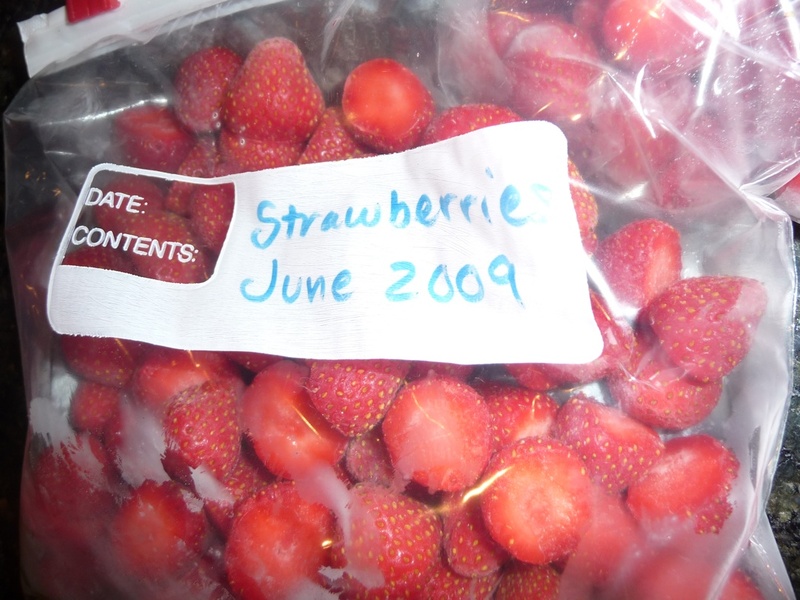 Strawberries in the freezer can last 6 months to a year — but I doubt they will last that long just because we like to eat them. I froze cherry tomatoes and regular tomatoes whole last year and threw them into soups all winter long…it was really good! No cooking before hand, just wash and freeze! We’re getting ready to freeze our rhubarb this weekend. And we also missed the opportunity to freeze some pesto last year, too. Big regrets! I won’t make the same mistake twice. did some sliced peaches which are plentiful from road side stands here in the south from local orchards, apples too though I chop them fine to freeze. Even grapes that we don’t dry into raisins we put in the freezer to make drinks out of- or pop in your mouth frozen. Blueberries too. Any secrets to freezing rhubarb? Also, Jean Nick — can you share the rhubarb ginger leather? ?